At dinner with colleagues in New York last week, my husband Richard and I were asked about our recent trip to Russia. We reported it in a word: “Glorious.” We’d agreed on the flight home that we’d be hard pressed to explain the intense feelings we shared during our ten days there; that our description of the exact silver hue of the “white nights” at 3 a.m. over shots of icy vodka would pale (next to, say, Dostoevsky’s better one); that any word pictures of the Rembrandts in the Hermitage would bore a listener into a coma; and that any heartfelt sharing of emotions raised by Chekhov’s gravestone in Moscow’s Novodevichy Cemetery, or by the shade of the ancient amber in the Amber Room in Catherine’s Summer Palace, or the delight in the “surprises” inside Faberge’s bejeweled Imperial Easter Eggs in the KremlinArmouryMuseum, would not do. Anyway, other things were on our hosts’ minds. No, we weren’t scared; nor were the military lining up in Red Square. “Did you feel that your room was bugged?” asked a book publisher. We’d considered that one before we left, given the number of Cold War spy novels my husband has edited, but no. And then there were questions about the Russian people: Weren’t they still depressed by Communism? Outside the cities, weren’t they downtrodden, oppressed, poor? The few Russian people we did get acquainted with were our hotel staffs, guides and drivers, without whom we would have been literally lost. 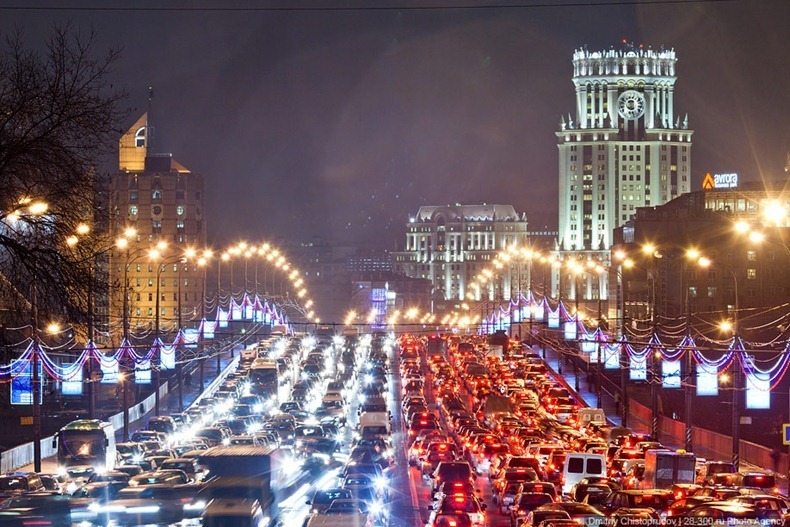 Moscow is, as everyone knows, almost a thousand square miles of traffic-filled, fast-paced business activity. Roughly 12 million people live in the country’s capitol on the Moska River. It’s different from any other city—Cairo, Istanbul, Marrakech–I’ve ever been to. St. Petersburg, on the Neva River, is not quite so vast and populous (a mere five-million inhabitants), but still bigger (556 square miles) and more magnificent than I could have imagined. The reports I’d long heard: “Loved St. Pete’s, but Moscow, not so much.” But you are most likely to love them both, in different ways, if you rethink your usual vacation priorities. In both cities, you need, not want, someone who helps you beat the crowds so you can see works of art before (or after) the tour buses land; someone who can whisk you to the rooms in the Hermitage you most want to see. You need a guide and driver who notice, while walking you to the track with your luggage, that your morning train to St. Petersburg has had a (truly) last-minute track change; or that your afternoon flight to Stockholm or to Helsinki was canceled but another one is slated to depart an hour earlier; that the opera you’ve paid in advance to see at the Bolshoi was canceled, but a ballet at the smaller annex Bolshoi is being shown, and tickets have been bought for you. I cannot emphasize this enough. Lots can go wrong, and will, without savvy guides. In a country whose alphabet you can’t read, and a language in which you are probably unable to summon up a simple hello (“Zdravstvuj!”) without practice, the price of the ticket for being well looked after is high. To taste the quality of pirozhki that Tolstoy raved about; sample the pelmeni in both styles—in broth or standing alone, as a ravioli, with a dollop of creme fraiche, sour cream and dill; to test the Platinum Russian Standard vodka, or the even better ones that come in squat bottles with unpronounceable names; to plop generous spoonfuls of red caviar on your blinis at the breakfast buffet–it’s going to cost you. Even if “value travel” is your motto, its meaning for a trip like this must be altered. 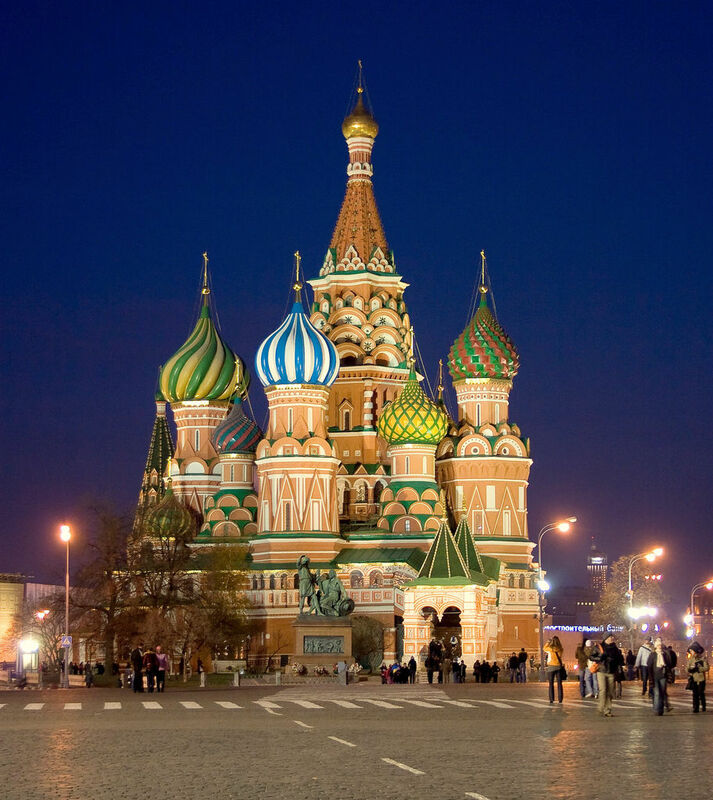 Moscow is not Paris; you can’t just wander about and find a charming, homey B& B; moreover, you do not need bad pillows, inadequate laundry service and inedible borscht to increase the pain of jet lag. 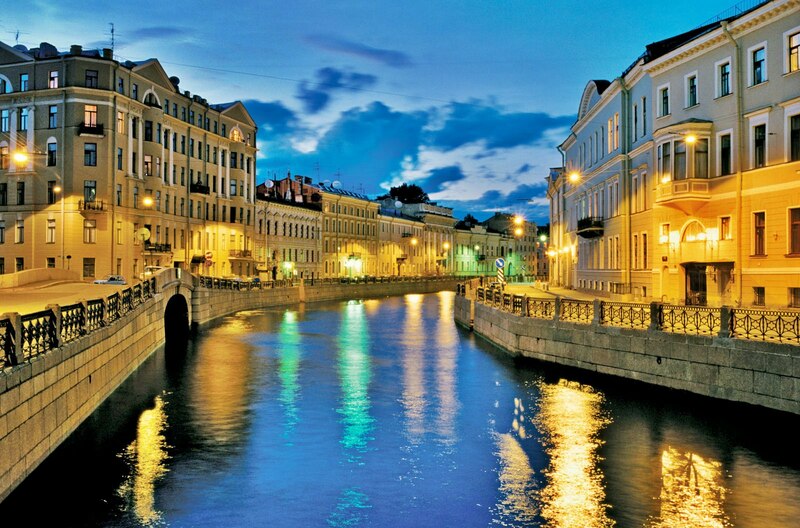 St. Petersburg, the fabled “Venice of the North,” is not Venice: you won’t be ducking into little pasticcerias along the Moika– unless you happen to know people who can take you and order for you. 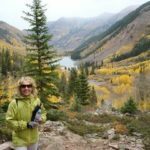 Even if you’re sleeping on a cruise ship and these amenities are taken care of, you’d do well to invest in a private guide in both cities if the cruise line doesn’t provide one. The Nikol’skaya will not be the Baltschug’s “little” sister much longer. The building is actually a complex of historical buildings, once the residence of one of the wealthiest aristocrats in Russia, Count Vladimir Orlov-Davydov—a descendent of the same Orlovs so highly esteemed by Catherine the Great. Which reminds me: It will only add to your knowledge and pleasure if you read Catherine the Great, by Robert Massie, before or during your trip.) Great pains are being taken to preserve its beauty, and even the mosaic built in 1907 by the French architect Edouard Nierman has been partially saved. 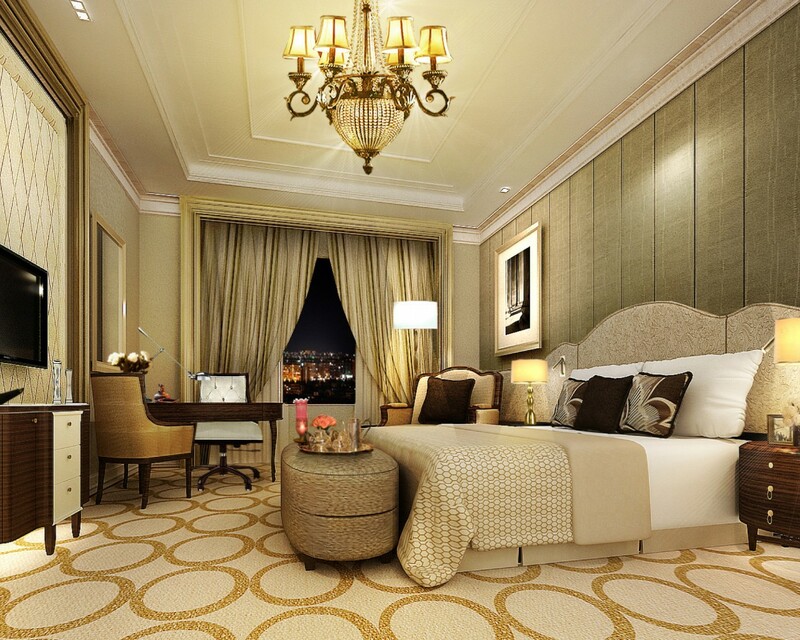 Only one of the six planned restaurants, each with a different theme (like, a cigar club; an Italian bistro; a Mojito rooftop bar), was open, and just a few of the 211 rooms and suites. The one restaurant that is open, the MosaiK, provides the single most glamorous breakfast buffet I’ve had since the famous brunch at The Four Seasons Hotel in Miami years ago. This surpasses it. 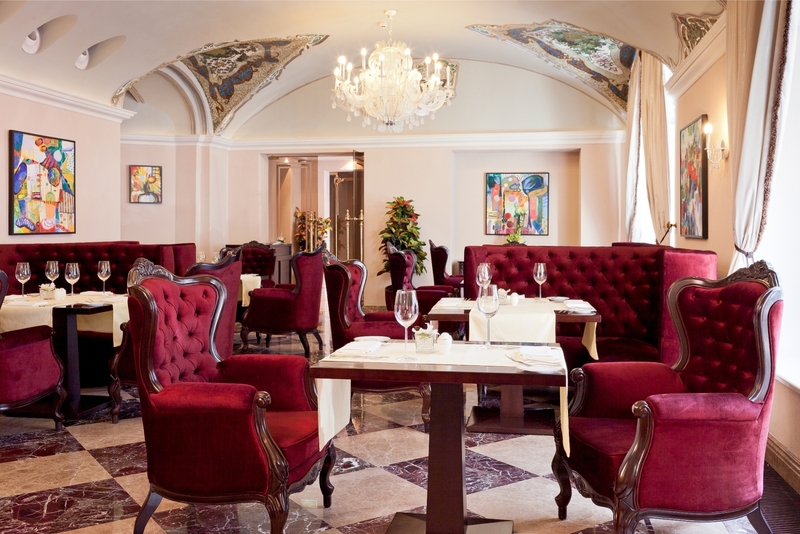 The outpouring of warm breads, the squeezed-for-you vegetable and fruit juices (or go a different route and have Champagne), the caviar and blini….all fresh and perfect and, value travelers should know, come with your room. 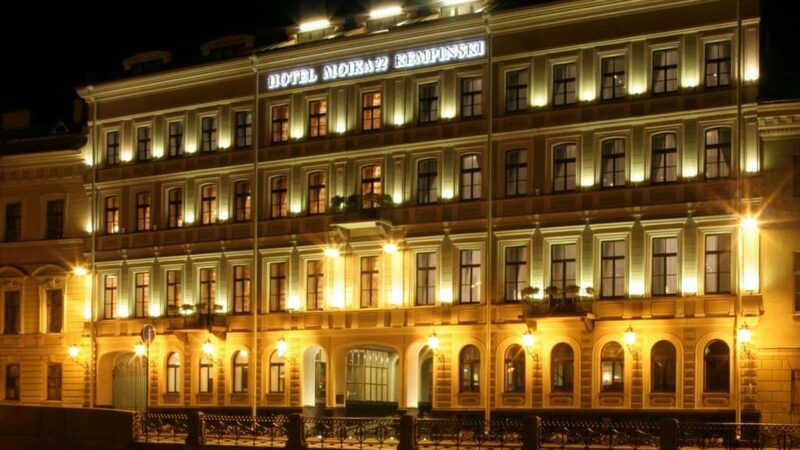 Because the opening of another eagerly awaited hotel, the Four Seasons in St. Petersburg, was delayed, we took our cue from the pleasure we had at the Kempinski Nikol’skaya and stayed at the Kempinski Moika 22. Not as glamorous as the Moscow property, but very popular, wonderfully located (near the Hermitage, for one thing) and with a skytop restaurant–the better to see the White Nights–that serves excellent Russian and international cuisine, inside and outside, till all hours of the morning. It was fun just to watch the people coming in and out all night, from the jeans-clad to the eight-inch-spike-heels set. A word about our guides: There are many firms that offer guides, from very expensive to not-so expensive. On the advice of friends, we used the Seattle-based MIR Corporation (www/mircorp.com.) to plan our Moscow trip; the firm provided our custom tour and our terrific guide, Irina Zhiltsova (and our driver, Rashid). For information, contact Olga Hayes at MIR: olga@mircorp.com. In St.Petersburg, again on friends’ advice, we used an independent guide, Larissa Konshina, also wonderful, who can be reached directly at larissakonshina@hotmail.com. She will arrange your itinerary, and provide a driver (we had the unflappable Yuri) herself. Also: Your guides will take you to very inexpensive lunch spots, knowing you’re paying for them, too. Should you wish something more than a sandwich, or to book at a specific restaurant for lunch, make it clear. Men Who Drive Strong Women Crazy), now out in paperback. 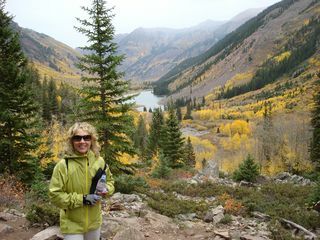 Her travel articles and essays have appeared in various magazines, including Travel & Leisure, Conde Nast Traveler and Diversion. She has appeared both as author and social observer on Oprah!, The Today Show, Larry King Live, The Charlie Rose Show, and Good Morning America. On a Friends of Ballet tour in 1986, we spent 2 unguided hours at the Hermitage. In a room of a special exhibit, I was surprised to see paintings I had seen at a museum in Tulsa, Oklahoma. They were the collection of Armand Hammer, a long=time friend of Russia. Our visit was 2 weeks before Chernoble. It was an incredible trip made even more memorable by its period in history. Nancy, how exciting that must have been. We also spent unguided time at the Hermitage, but it was absurdly crowded that day. Our first trip there was guided, and the rooms were quiet, so we moved around effortlessly. We saw three ballets, the most extraordinary of which was during the white nights’ festival at the Maryinski in St. Petersburg: Ulyana Lapotkina in Swan Lake. Now, I’ve seen many a Swan Lake over the years, but never one with as luminous a dancer. If she ever comes back to the states, do make the effort to see her if you can! Ah yes, the visa. Well, it’s not a nightmare, it’s just so absurdly time-consuming. And so many questions about my past I simply didn’t remember!. A tip: Consider getting medical insurance. I was told that there is some concern that visitors will be sick while on the trip, and that they (who look over our visas) appreciate it if we’re insured. It’s an extra expense on an already expensive trip, but a good idea, I think.